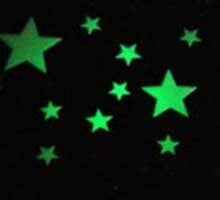 Light charged pigments provide a phosphorent green glow when the ink is placed in the dark. 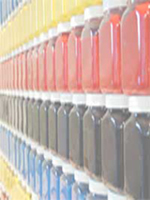 Trade quality pigments give years of use and thousands of charges to keep designs glowing for years. Ink is a standard type and can be printed onto dark colours, drying a light cream/ off white colour. Ink can also be overprinted onto other colours to hide or mask the design. Colour pictured above is as accurate to printed colour as possible, however glow effect can not be reproduced. Some minor colour variations may occur when printed. Test ink colour prior to printing if required. Information Sheet 25 - Screen Printing Technique view now . . Fabric inks require heat setting to activate the pigments and set the ink to the material. The temperature required must be hot enough to firstly evaporate the water based medium, then set the pigments (minimum 150°C depending on the material to be heat set), a household iron, Ink Setting Heat Press or commercial tunnel dryer are recommended. View equipment, how long and technique for setting Fabric Ink's - click here . .
See individual ink label for details. Clean with water only. Due to the web site upgrade this information is currently unavailable.